A look at Big Heart Lake, the reward at the end of a glorious 7.5 mile trail near Skykomish. 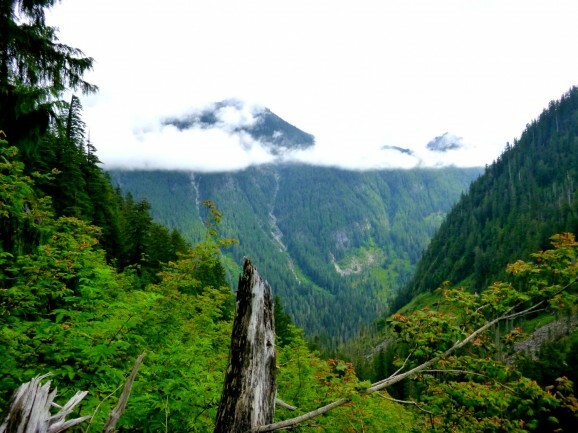 On the other side of Stevens Pass, just about an hour from Leavenworth, sits the West Fork Foss Lakes Trail. It offers an entirely different climatic region, four breathtaking lake views, technical terrain, and a moment for pause. Air-filled with moisture provides the nectar of life here, allowing old-growth cedars to flourish. The lakes are so deep, tranquil and dark that you wonder if the foretold ‘Nessie’ lives below their depths. 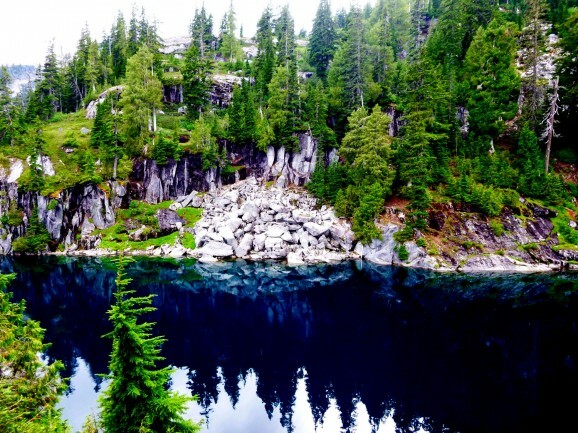 Simply put, this 15-mile in-and-out adventure (encompassing 3,330 feet of elevation gain and loss) is definitely worth driving an extra 10 minutes out of Chelan County to access. 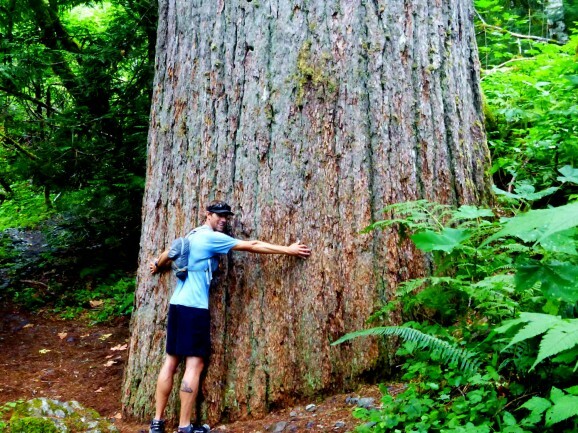 Jared Vilhauer hugging a large cedar. A few weeks ago, Jared Vilhauer (my partner in life and running) and I decided to take an adventure to the west side. I know, I know. Venturing to the other side can be dangerous! Bigger trees, RAIN, humidity, things that we don’t really have along the east slopes! Why would you want to leave this nice, dry, and arid environment — especially to go for a run? Well, I am a person of curiosity. Curiosity has always fueled my spirit and led me to new and interesting places. It’s what makes humans innovative, providing advances in technology, and has helped us explore and find new worlds. I’m no Jacques Cousteau. I’m just a regular person giving into that curiosity. In my own small ways, venturing to the west side to get out on a trail is my own form of exploration. It stokes the fire that keeps my spirit burning bright for discovering new places and trails. Jared and Amber on the 15-mile outing. 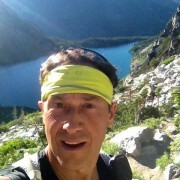 I had talked with RunWenatchee’s Steve Maher about some trail suggestions around Stevens Pass. Never being there, I really had no idea what to expect. I consulted the Washington Trails Association website to take a look at some suggestive trails in the area. 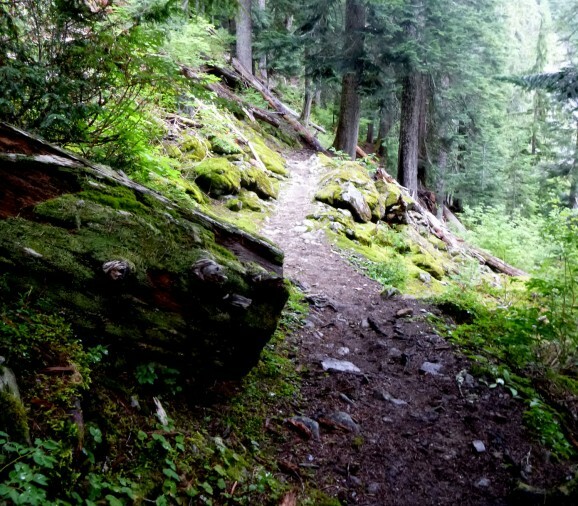 Using Steve’s suggestions as a starting point, we looked at different trail options close by. Consulting our topo map, we found a trail that covered 15 miles (in and out), looked as if it followed a ridge line (meaning great views), and would pass by a few lakes. What a lovely Saturday afternoon mission. We packed up the car and headed west. 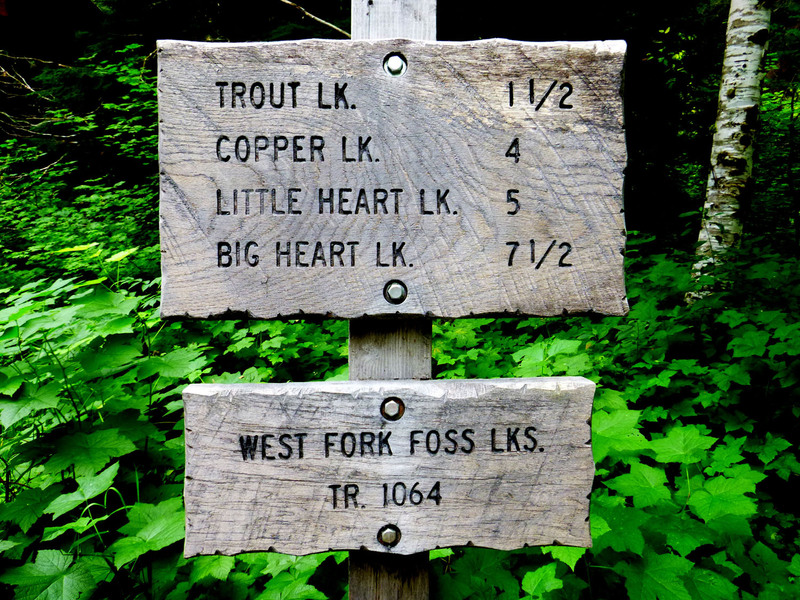 An hour-and-a-half later, we arrived at the West Fork Foss Lakes Trailhead. We jumped out and headed on the trail. A look at the lakes and their distances from the trailhead. You can choose to go all the way, or just a few miles. Being a hot day in Wenatchee, we were relieved to find some cloud cover that was able to shroud out the sun’s rays a little bit. The clouds hung low in the sky as we made our way on the nice and easy single track. As it goes, we would first encounter Trout Lake (1.5 miles), then Copper Lake (4 miles), then Little Heart Lake (5 miles), and finally Big Heart Lake (7.5 miles). All the distances there are from the trailhead. 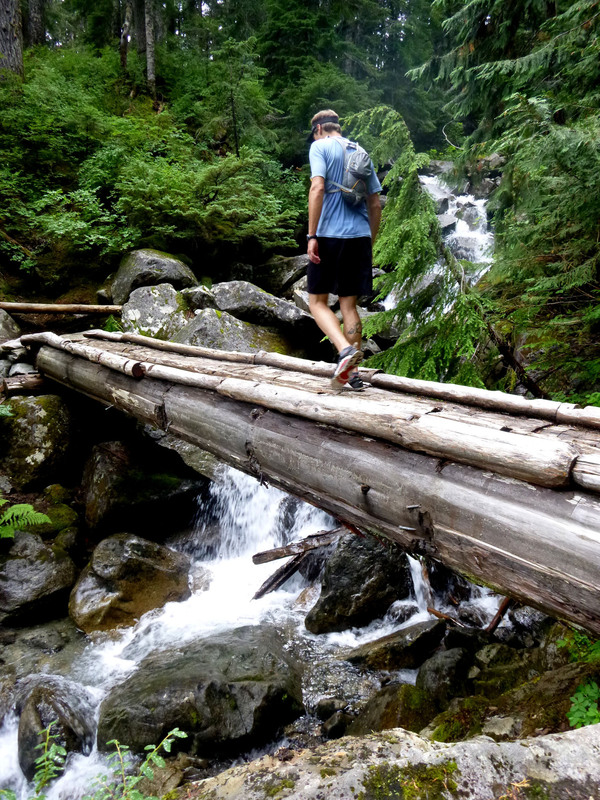 Great runnable single-track that weaves its way past lakes and through the forest. 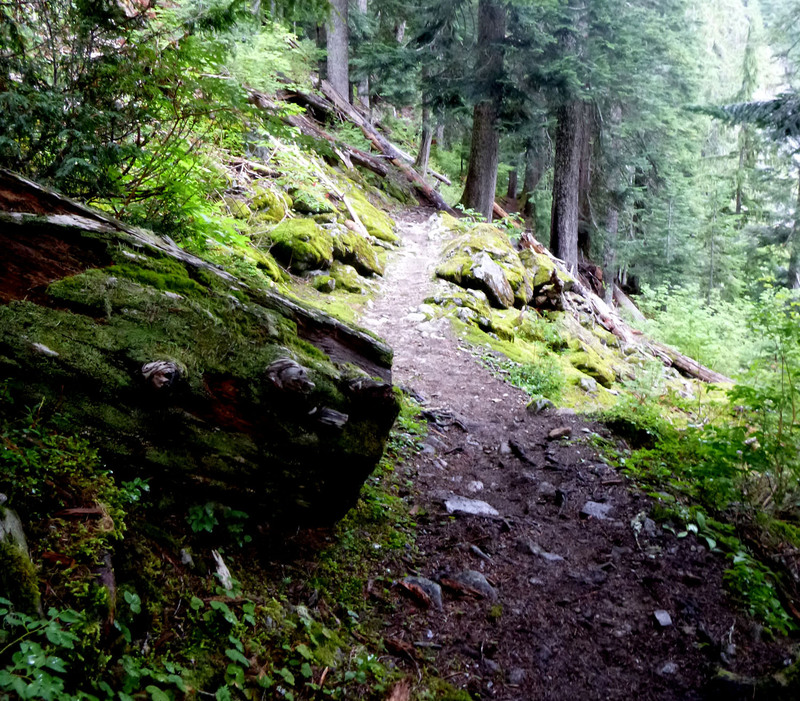 This was a great section of easy dirt and pine-laden single track with a gradual uphill grade. Once at this lake, we encountered families camping with small children, a women painting a portrait of the lake, and kids fishing and enjoying the views. 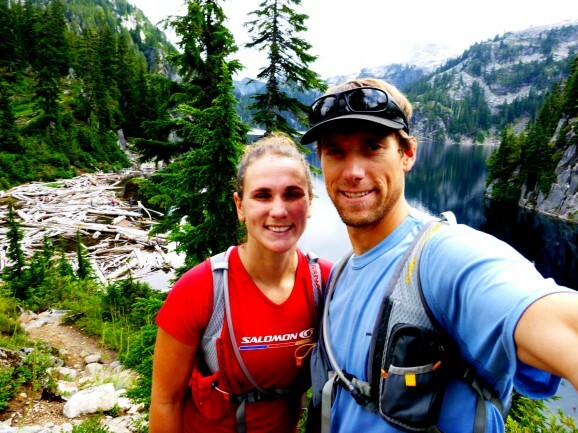 If you’re not running, this is a great option for folks looking for a little weekend camp getaway. 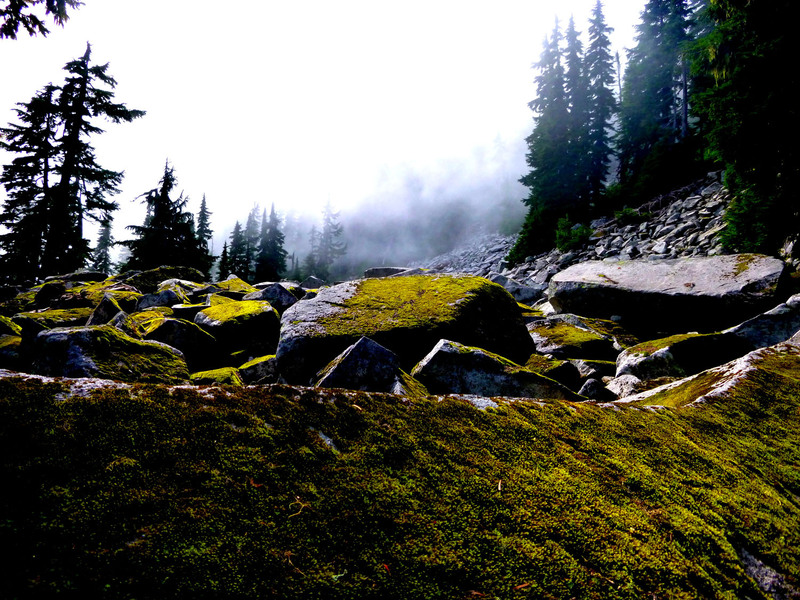 A look at the technical terrain you will encounter on this adventure. Once we headed out from Trout, the trail got steep. This stopped us from running, and we continued with a fast-paced hike. The trail was technical with many rocky steps that switch backed underneath small waterfalls and streams that crossed over the trail. A beautiful bridge made of cedar takes us over a creek. We encountered fantastic bridges, constructed from downed cedars that provided a footpath across larger streams. Ascending approximately 1,000 feet brought us up to Copper Lake. This is pretty good-sized lake that provides another great camping, fishing, swimming, and relaxation spot in the summer and fall. 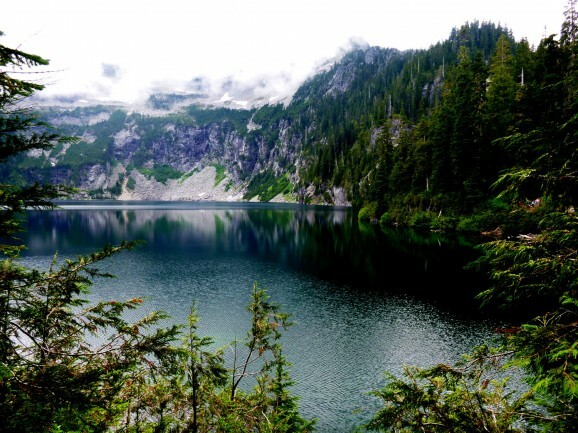 Copper Lake offers panoramic views and a great place to camp. We continued from Copper to Little Heart Lake. Here we saw a couple having some private time, fishing, and glowing in the presence of one another. We quietly ran by, trying not to disturb the tranquility they had found in these woods. Climbing along a ridgeline we were able to see expansive, cloud-shrouded valleys. Our destination was to get to Big Heart Lake, spend some time and turn around. Once we passed Little Heart Lake, the trail got steep again, climbing higher into a cloud-laden heaven that offered great views of lush valleys. Rocks are covered with moss, a quality that you`ll see in the temperate rainforests of the west side. Our prize was at the end of that trail. When we rounded the corner to Big Heart Lake, after following a somewhat scenic ridgeline, my jaw dropped and I was astounded by the absolute size and beauty of this lake. 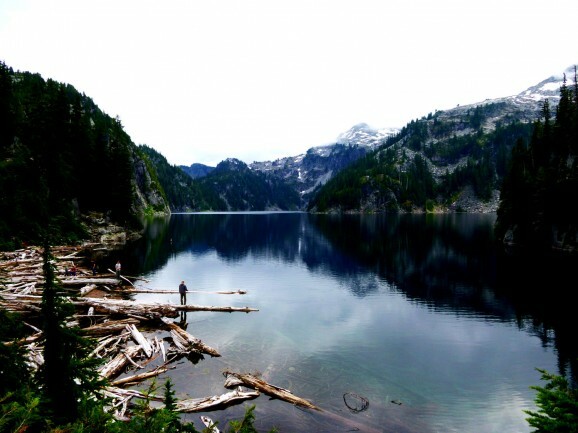 Big Heart Lake: A beautiful place to fish, camp, and run to. The water was an azure — deep and cold. It was calm and reflected the looming pines and cedars surrounding its banks. Beautiful white granite cliffs blasted up from its surfaces, making it inaccessible, solemn, and almost untouchable. A place only the truly adventurous and brave would attempt to get to. 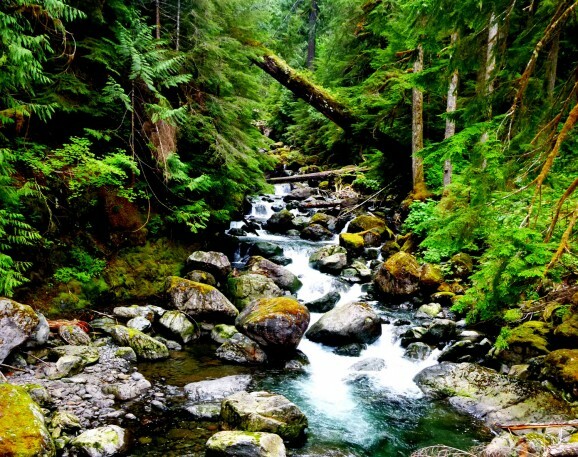 A beautiful stream provides a moment for pause along the way. After spending some time here, we packed up, shoo’d away mosquitoes and headed back down the trail. 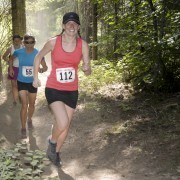 Running down technical trail keeps you focused, but also presents you with moments of reflection and clarity. Thinking about today’s accomplishments, the beauty that we were able to see, and how little time it took, put a big smile on my face. Why do they call them the Cascades? 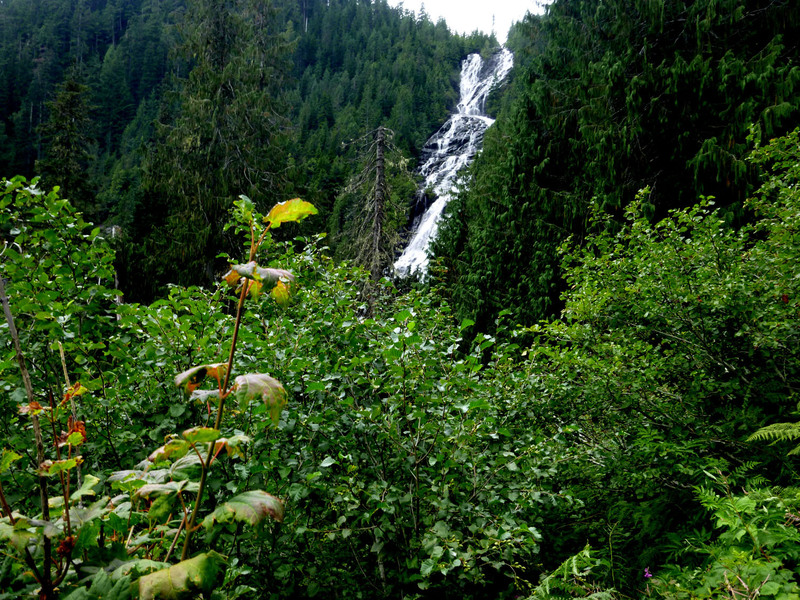 Waterfalls are everywhere! An hour or so later, we were driving back to the east slopes of the Cascades. Happy to have explored a new land, but also happy to know that we were going home. So, even though some of these trails are a drive away, don’t be deterred by the fact they are on the other side. The other side brings a plethora of possibilities. 1. Follow signs to Highway 2 west for 67.5 miles. 2. Just before entering Skykomish, and near the Ranger Station, turn south on Foss River Roead (Road 68). The pavement will end in 1.1 miles. After that, look out for potholes. 3. Passing under a railway trestle (1.3 miles up), stay right at the fork in the road. 4. In another mile, stay right at the fork again. 5. 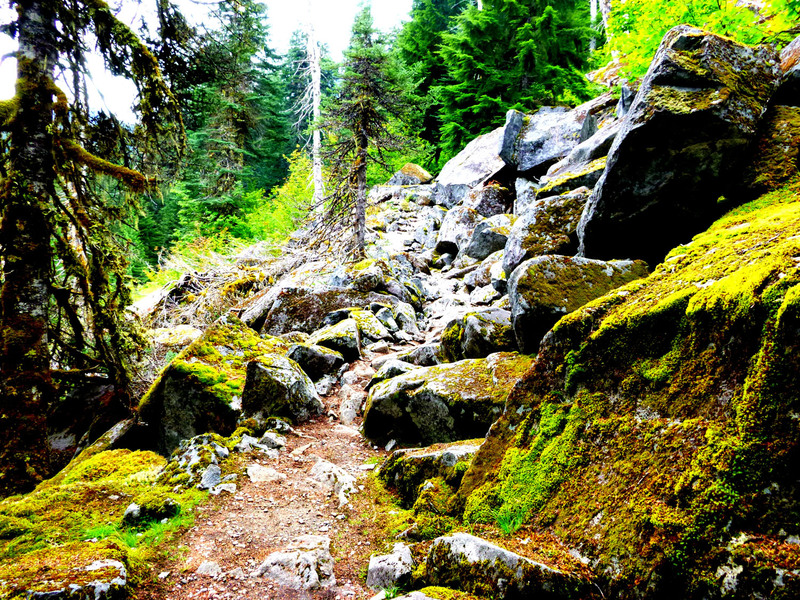 In 0.6 miles, pass by the trailhead for Necklace Valley Trail. 7. Continue for 1.9 miles to reach the trailhead. Get out and enjoy the cool weather!